Does the mere thought of procrastination provoke a sense of uneasiness and even mild-to-moderate guilt? Is this actually a task or is it a goal? If it’s a goal, what is the first task for you to accomplish toward it? For example, if I want to lose weight, that is my goal. I will then need to choose concrete steps toward achieving it, perhaps no longer buying high-calorie snacks, or eating smaller portions. If what you initially chose is a goal, pick a beginning action step toward it, and apply the questions below. Do I truly need to do this task? Is it actually a low priority item for my values, a “should” from a sense of social expectations or obligations? Or is it something that is more appropriately someone else’s responsibility? For example, has your child reached an age where he or she could put away his or her laundry, benefitting by taking responsibility for this task? Do I want to do this task? Does it help me to achieve something I value? Or help to prevent something I find detrimental from taking place? Take a look at the longer-term benefits here. While your task may not have short-term appeal to you, its longer-term value may get you over the delaying-hump to act on it. For example, if I want healthy gums and teeth, I may choose to floss daily despite any dislike I may have for the action itself. Am I able to do this task? Or do I need more information, skills, or other support? If so, what steps can I take to equip me to complete this task? Do I need to chunk this task down into a series of smaller, more easily accomplishable tasks? Is there something else I need to do before tackling this task? Do I need more sleep and/or nutrition to be able to accomplish it? Do I need to clear a physical space (desk, counter, etc.) to be physically and/or mentally able to do it? Do I need to obtain and/or organize the materials involved to be able to do it? Is there a different task that really, truly is more important for me to take care of first? Am I afraid of failing (or of succeeding) at this task? If so, what potential consequences of this are concerning me? How might I respond effectively to my concerns? Who or what might support me in responding to these concerns? Are these potential consequences of greater or lesser concern to me than the risks involved with not following through with this task? Am I simply in the habit of not doing this task? If so, what steps can I take to help me create a new habit of accomplishing this task? Is there someone or something that might help support me in creating this new habit? Is there a better way for me to accomplish this task? Is there a more efficient method for me to do this? A more enjoyable one? A better perspective on doing it? A better time of day for me to do it? Might it help me to schedule it in or tell someone supportive when I will accomplish it? Set a deadline for its completion? Reward myself in a healthy manner for following through at each step along the way? Would it be better for me to request, barter or pay someone else to do it? As Pychyl explains “Procrastination is really a self-inflicted wound that gradually chips away at the most valuable resource in the world: time.” Only you can discover what you need to do to help heal that wound and reap the rewards of time well-spent. Roslyn Elena McGrath is the author of Chakras Alive! and other personal growth books and CDs. She recently released a recording of the Chakras Alive! meditations, and also offers workshops and private appointments. For more info., visit http://www.empoweringlightworks.com or contact (906) 228-9097, info@empoweringlightworks.com. This is the final article of a seven-part series on your 7 main energy centers. All of life includes a spiritual component in that we are all part of something beyond what we can identify purely with our physical senses. Our attention is often focused primarily on the physical, yet our lives can be so enriched by deepening our spiritual awareness. As you move into the holiday season and beyond, how might it feel to include more attention to this vital aspect of being alive? Developing your understanding of your crown chakra, the energy vortex located above the center of the top of your head, can support you in deepening the spirituality in your life. Here is a first-person description of it, followed by questions to consider, and some ideas on how you might support this part of yourself. I am your link to Heavenly Creation. I am your source of knowing Heaven while on Earth. I help you relate to otherworldly experiences. I assist your linkage with those who have made their transition, those who are in the process of coming into human form, and those who are your spiritual teachers and guides. I assist you to experience other lifetimes, parallel realities, and much more. I enlighten your load, allowing you to process current challenges in the context of spiritual discipline, spiritual awakening, and spiritual mores. Everything becomes easier as you bask in the Light of the vastness of Being. It is as if you look to the stars, recognize their relationship with your own human heart, and relax into knowing that you are part of the wonder of All That Is and that your troubles are minute within this universal context. I am the place where you can review your life in terms of spiritual growth and empowerment, know spiritual teachings through your Soul, and invite expansion of your human experience to encompass greater knowledge of Heaven and its potential to be lived on earth. I am completing a particular phase of human evolution right now, in which you transition from having been instilled with a strong sense of separation from other forms of life, from the crux of Creation and from one another, to a consciously felt sense of connection with all of life and its source as the dominant factor. You will continue to know yourself as an individuated facet of the God experience on Earth, but with much greater awareness of your origination from and connection through Source. You are in for quite the magnificent ride! It behooves you to dwell upon my vortex, in combination with your other primary vortices, of course, in order to utilize better the influx of incoming Light and ride the waves of shift with greater comfort and Grace. Indeed, I am a portal through which much Grace can flow. And I am thrilled to play such a pivotal role in your ongoing evolution! – Do you have a sense of the Eternal and Infinite? – Do you cultivate a sense of sacredness? – Do you know yourself as part of the web of all life? – Do you experience your life as having purpose and meaning? – Do you experience Grace? Go to &/or create a special place where you feel you can best connect with your spirituality. Give your full attention to the moment. Wear and/or surround yourself with shades of violet and/or lavender. Wear amethyst, sugilite, charoite, selenite, diamond, and/or other crystals supportive of your crown chakra on your person, and/or place in a well-frequented, visible spot in your home. Keep spiritual pictures, statues, and/or other items in your environment. Dab a little rose, lotus, helichrysum, or other essential oil supportive of your crown chakra, diluted with jojoba oil or other unscented carrier, just under your nose, on a handkerchief you keep with you, or diffuse in your home and/or work space. Read about and/or watch movies about spiritual experiences. In a quiet, comfortable space and undisturbed time, visualize a brilliant violet-white in front of you and all around you, breathing it in until you eventually feel as if you have become this color, then ask if there is anything your crown center would like you to know. Adapted from Chakras Alive! © 2015, Roslyn McGrath. What if . . . you received each dollar that came your way with appreciation for all the unknown people through whose hands it had passed, as well as for its potential uses in your life? What if . . . you looked at each penny spent as a clear expression of your values and priorities? What if . . . you felt the balance between what you are giving and what you are getting, each time you made a purchase or received a check? What if . . . you deeply appreciated the wide range of exchange options a monetary system can offer? What if . . . you intended that all the money you spend or give brings good to all its future recipients? Take a moment to imagine doing one or more of these practices. How does it feel? What kind of impact do you think integrating such practices in your life might make on you and others? Most of us were not raised to act on, or even consider, such possibilities. Typically money has been both deified and vilified in our society, yet money is simply a tool, a vehicle for exchange, whose potential is what we make of it. Often there is tension around the topic, and/or reluctance to look at it clearly. How might you bring more clarity, playfulness and positive creativity to the subject in your own life? As we come into a new season of giving and receiving, and each new moment of living, I think it’s well worth considering how we might best clean up our thoughts and ideas about money in order to bring our best to all our future exchanges. Your imagination can be a powerful tool for jump-starting this process. For example, you could play with imagining a divine hose that clears off any muck from your concepts of money, making way for fresh possibilities, and then act upon them. It takes commitment to change old patterns. If there’s an idea in this article that appeals to you, or one of your own that comes to mind, you might begin there. Gratitude journals have been touted by Oprah and others for their effectiveness. How about keeping a “Re-Creating Money Journal” to reflect on your experiences with this? Or consider the simplest thing you might begin doing right now toward improving your relationship with money and start there, adding your next step when ready. If you prefer an in-depth re-creation of your relationship with money, you might consider implementing the program offered by Joe Dominguez and Vicki Robin in their classic book, Your Money or Your Life. The world is what we make of it. Let’s bring our best to the topic of money and create our financial relationships anew. You might be amazed by all the other relationships this clears up too! Roslyn Elena McGrath publishes Health & Happiness U.P. Magazine, and shares energy, insights and inspiration to shine your light at Empowering Lightworks. She’ll be facilitating a “Maximum Manifesting Workshop” on Oct. 15, 2017 For more info., visit http://www.EmpoweringLightworks.com. Adapted with permission from the Winter 2011 – 2012 issue of Health & Happiness U.P. Magazine, copyright 2011. All rights reserved. NEW Issue & NEW Prize Drawing! The Winter 2014- 15 issue goes to print today. 9,000 copies will be distributed in 6 U.P. counties over the next week! 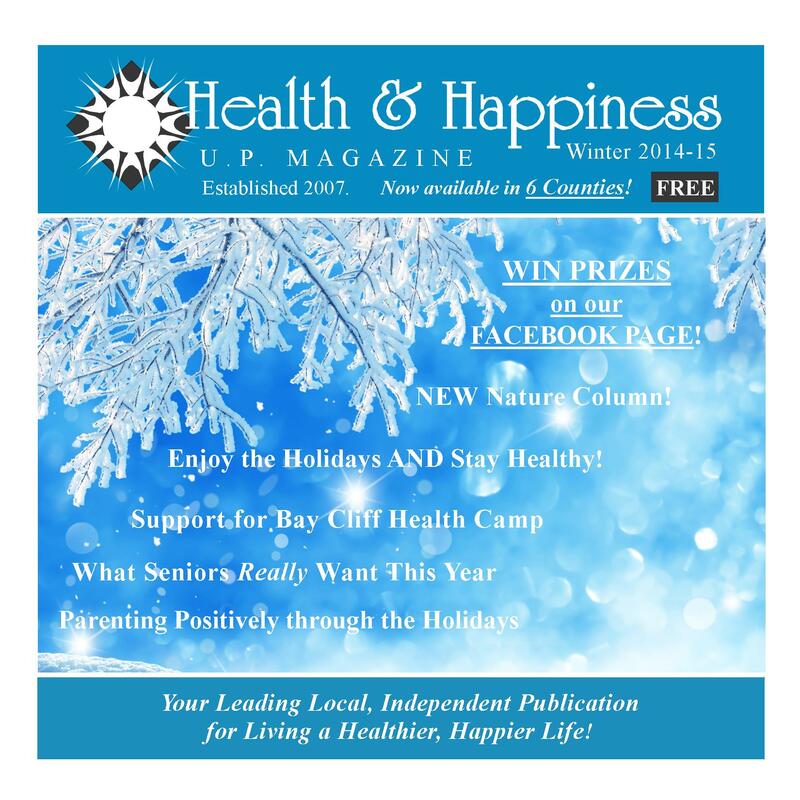 Check out great articles on happy AND healthy holiday eating, what Seniors REALLY want for the holidays, parenting positively, how to get mercury out of local fish, the power of pumpkin, financial wellness tips & much more! Click here to see where you can pick up a copy near you! And be entered to WIN PRIZES! You could win a 1-hour Massage from Angie Cherrette at Sage & Spry, a $35 gift certificate from the Brownstone Inn, 1/2 hour Reading plus Meditation CD from Roslyn Elena McGrath of Intuitive Learning Creations, total value of $145! Winner will be announced on Facebook on 12/20/14. Please SHARE on your social media – we’ll add prizes and give you ANOTHER CHANCE to WIN if we double our likes by this date, and TWO MORE chances to WIN if we triple our LIKES by then! Tagged as Angie cherrette, complementary health, Facebook, health and happiness, health and wellness, holistic health, integrative health, Intuitiive Learning Creations, prize drawing, Roslyn McGrath, Sage & Spry, survey, Upper Peninsual of Michigan holistic health, well-being, well-being in the U.P. Health & Happiness U.P. Magazine is celebrating its 7th Anniversary AND its expansion to serve 6 Central & Western U.P. counties! Today, distribution of 9,000 copies of our Fall 2014 issue will begin. That’s 6 times our original quantity to 6 times our original number of distribution spots. We’re also starting our 3rd year of additional support to a specific area of community life. Previously Health & Happiness increased its coverage of both senior and youth issues, and provided related donations to Marquette Adult Day Services, Start the Cycle, and Music for All Kids. This year, we’ll begin an added focus on Nature, with additional related content and local donation. THANK YOU for your important part in making all this happen. The local businesses and organizations that support healthy lifestyles, overall wellness and preventative care by advertising in our publication play an important role too in this too, so please give them a big THANK YOU! And be sure to check out the rest of our website as well as our Facebook page, where you can learn more, get updates on upcoming events and share your comments, questions and ideas. Adapted with permission from Health & Happiness U.P. Magazine, Fall 2014 issue, copyright 2014. Tomorrow, June 6th, Discover the Goddess Archetypes that most speak to you and how you can benefit from their inspirational messages for personal growth! Author, artist and intuitive Roslyn Elena McGrath will be sharing personally meaningful, helpful messages from her recently released books, Goddess Heart Rising: Paintings, Poems and Meditations for Activating Your Divine Potential, and The Third Mary: 55 Messages for Empowering Truth, Peace & Grace from the Mother of Mary Magdalene. Some of the original Goddess paintings featured in Goddess Heart Rising will be on view. The event takes place 6 pm at Panara Imports, 125 W. Washington St., Marquette, MI. Free Admission. Autographed books and Goddess posters will be available for sale. For more info., go to www.IntuitiveLearningCreations.com, www.GoddessHeartRising.com or www.TheThirdMary.com. stories, anecdotes, detailing your pursuits. into vessels that carry your essence. of living art that creates itself. the believer of the tales you’ve spun. and watch the kaleidoscope rearrange. ‘til the strand holding them together changes. and the whole puzzle is recreated. netting the nuggets that fuel their weave. echoing the sound wave its Originator made. create a new form that propagates itself for you. hanging in the mystery of the Void. that lives and breathes and moves. The chorus grows to support you. a spinner spinning itself into glory. Roslyn McGrath facilitates healing experiences through her art, poetry, intuitive counseling, energy healing, workshops and guided meditations. This poem was inspired by her painting Spider Woman, and will be part of her meditation CD series. Listen to other meditations, view art and learn more at www.intuitivelearningcreations.com. This article was reprinted with permission from the Fall 2013 issue of Health & Happiness U.P. Magazine, copyright 2013. All rights reserved.